McConnell's Mill State Park is a park close to home. This state park is well traveled but often overlooked for photography. For me it's one of my favorite places because of that. I can go and search and discover new angles that haven't been captured before. Along with that nature has this aura of calmness, even in the most catastrophic events; nature and landscapes give me the calmness I look forward to when shooting. This image in particular I was hiking down the trail past the Covered Bridge looking for a spot to shoot. While scaling some rocks looking around, I found this spot. A beautiful view of the Red Covered bridge, some green moss and water flowing in and out between the rocks. I was surprised by this view because it set up the perfect landscape scenario for foreground to background. As taking this shoot I was able to observe and relax; I had a long exposure set up to bring out of the crispness in the light and the smoothness of the water. The visual of smooth water makes the viewing of this image so much smoother. It is definitely one of my favorites from this State Park. If you ever have the need to go out and do light hiking around some beautiful nature near Pittsburgh, McConnell's Mill State Park is the place to go! Sunrises in Pittsburgh have always amazed me. I don't know if it's because I go at the right times or if it's all the time. But the images I tend to capture during sunrise always excite me. This past Thursday morning was a morning I thought was a bust. Showing up to the Duquesne Incline everything was foggy and you could only see about 50ft in front of you. This gave me the hope that maybe the fog would clear up as the sun rose. 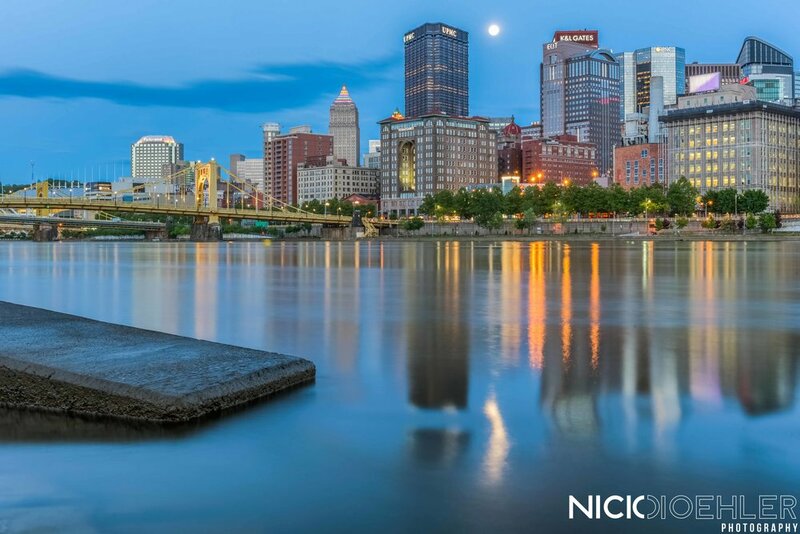 That happened to be the case and it gave me one of the most beautiful images I have ever taken of Pittsburgh. This had been my first sunrise shoot in probably 1 month and it excites me and motivates me more to go out in the early hours of the morning! This image is surely one of my favorites and I'll probably get a print of it for myself! Click Here for my last blog post! Click Here to purchase this Image! Click Here to go to my last Blog Post. Click Here to go to my Print Shop. This image is from the Duquesne Incline from Mount Washington in Pittsburgh, PA. I had been wanting to take this image for awhile before I finally went to capture it. I figured sunrise would be the best time to go. Watching the sun rise behind the city is one of the most beautiful things. The sun had just had a dramatic rise before this morning clear white sky sprung into action. This light brought the leaves a glow and a highlight on the side of the Cable Car moving up and down the hill. When noticing this light began to show I quickly changed my settings to accommodate the possibility of a sun flare shooting across the frame. What I like most about this image is the simplicity of how the city looks and the light casting across the sky hitting the summer leaves. I could not have asked for better conditions, and will be for sure back up here when the fall leaves settle in. Click Here for my last blog post. This image sticks out a lot to me when I look back on my trip to Italy. I was walking through the alley ways of Venice looking for street photography and anything to capture. I stepped away into an alley to relax for a minute and just look around. When, all of a sudden this man the "One Man Band" came strolling through the street in the middle of the day playing his heart out. The difference about this man than past street performers was that he was traveling around rather than staying in one spot. 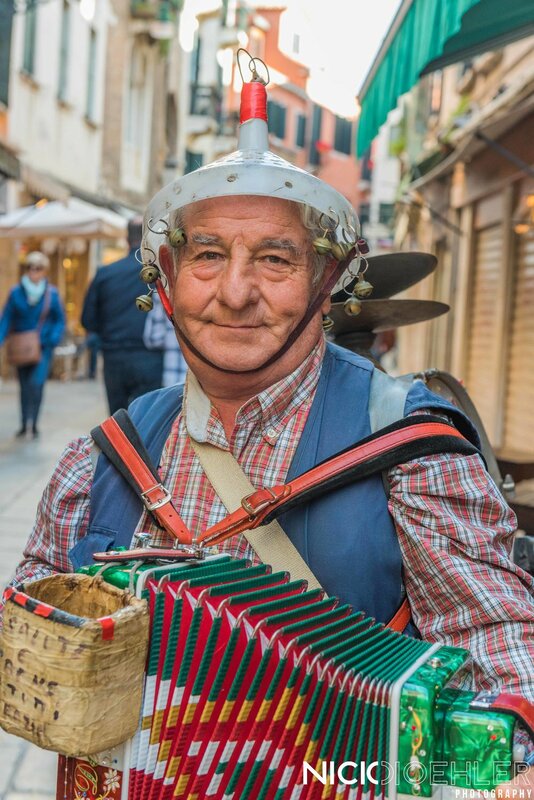 While pushing and pulling the accordion, his heels jingling, his back holding a drum that would keep a beat and cymbals also. And to top his performance off he was wearing a funnel-hat with bells and a strap. When hearing this character come down the street I knew exactly what I needed to do. I analyzed the situation and when he would make it down the street to where I was waiting. A few other photographers presences seemed to make the "One Man Band" shy away but he kept playing. Waiting a few moments till he was directly in a path with no one in his way I walked over and stood right in front of him and snapped a few quick pictures before giving some euros into his box. Normally I don't get in front of people and obstruct the natural happenings of the situation. This image however brought that out of me and I got the shot I envisioned in my head upon arrival of this "One Man Band". I've only ever been to the USA side of the Falls until this past Summer when I was able to experience them from the Canadian side. Seeing how large scale and amazing this water fall is sure a motivator to push closer to where I want my photography to be. I love traveling so much it's all I can think about when I have time. I hope to be able to start traveling again soon to get some new landscape content for everyone. Been around Pittsburgh a lot and filling up my Pittsburgh Portfolio very quickly. 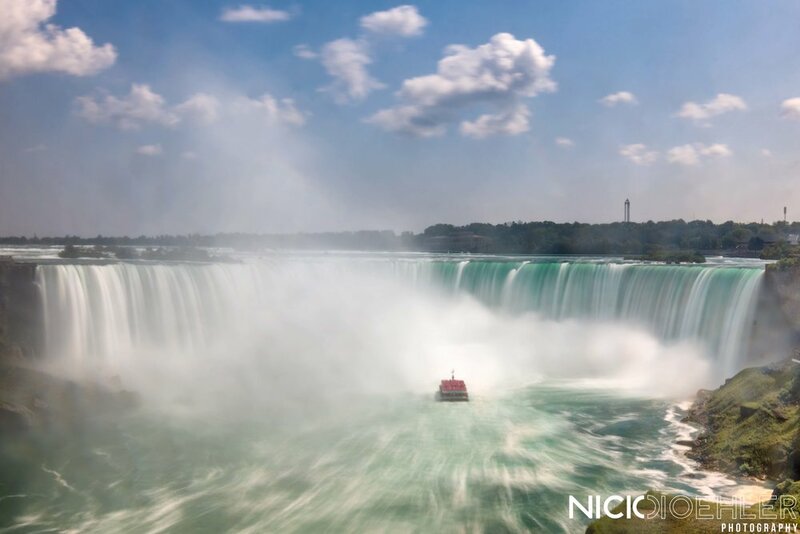 But for now, enjoy these photos of Niagara Falls! Click Here to go to my print store! This national park is on the Western side of South Carolina. It is home to a beautiful swamp based area with a lot of mosquitos, spiders, and many other animal species. The main trail here is the Boardwalk Trail which takes you through a swampy area filled with Cyprus trees, Cyprus knees, and water logged spots. The main wet seasons for this park are in Late Winter, Early Spring. If you are down in South Carolina I'd recommend checking out this National Park. Just watch out for mosquitos. Definitely a spot to check out if you're interested in a Marsh land type forest on the East Coast! Pittsburgh in my opinion is one of the most photogenic cities. Being able to live near Pittsburgh gives me the opportunity to continually capture images of the beautiful sights around. The different architecture and the perfect horizons for sunrise and sunsets give Pittsburgh a whole different dynamic. This blog post will be updated with new photos every so often with Pittsburgh sights! So make sure to keep checking back to see new things that are being captured and uploaded. Thank you so much for checking these out! If you have any requests or questions feel free to ask! Click Here to go to my Print Shop! A country full of culture, history, great food, and beautiful view points of it's cities. Venice, Florence, Siena, and Rome are the cities I was able to visit on this trip to Europe. Having going to Europe my first time I was quickly amazed by the 1,000s + years of history and architecture. My favorite destination was probably Venice for how easy to get around and the culture of no cars. The city was very small and relaxing. Florence was my second favorite, it was a good in-between of cars and walking/biking. Going to Italy was sure a life experience that I will never forgot and these images will motivated me to continue pushing for my dreams and aspirations. Baltimore is a mid-sized city in North Eastern Baltimore. The city has a lot to offer from it's harbor, amazing architecture, to the clean streets; Baltimore is a pretty city. Before I got to Baltimore my friends and I traveled more south to go to Solomon Island. After Solomon Island we traveled back up to Baltimore and photographed the city from sunset till no more sunlight or magic was happening in the sky.